Dimensions 36' by 28'5" by 13'1"
The P-66 came out of an experiment in building four different aircraft types from common components. The fighter variant was ordered by the Swedish government as the Model 48C. However, by the time the order was ready, the United States had embargoed aircraft exports and the production run was impounded. The British took over the order as Lend-Lease, but 129 of the aircraft went to China instead, where they saw their only combat service. The remainder were used as trainers. 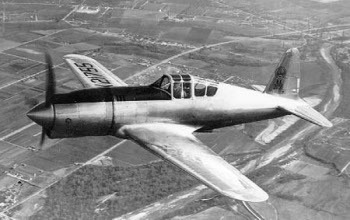 The aircraft had good acrobatics and reasonable performance for 1941, and the few U.S. pilots who flew it seem to have liked it. However, it was relatively fragile and had a tendency to ground loop. It also had an unfortunate resemblance to the Japanese fighters in use in China, and several were lost to friendly fire.